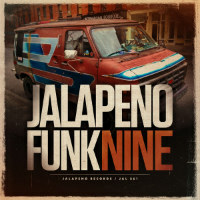 I don’t know about you but there’s almost as many shades of The Italian Job about the retro red, white and blue van on the cover of the Jalapeno Funk Vol. 9 as there are shades of the 70s Bronx. Which makes it the perfect visual metaphor for a twenty-one track compilation of British funk, soul and funky-breaks inspired by the golden era of Stateside funk and soul. Twenty-one?! You were only supposed to blow the bloody doors off! Still, as we always say at MB Towers, if you’ve got it you might as well shove it all on one compilation. And Jalapeno have certainly got it – what with The Allergies being in everyone’s year-end best-of lists and plenty of other epic outings in the last couple of years – notably Smoove & Turrell’s mighty Crown Posada LP but also a highly respectable set from Izo FitzRoy and a well-deserved re-release of John ‘Kingmaker’ Turrell’s 2014 solo LP. All of the above are represented: Smoove & Turrell with Crown Posada LP track 50 Days Of Winter, Izo FitzRoy with I Keep You Guessing and Break The Levee from her Skyline album, The Allergies with the soul-pumping beats of Special People and second LP title track Push On, and a solo JT with The Temper and Won’t Get Fooled Again in its Basement Freaks remix incarnation. Basement Freaks appears in his own right on two solo cuts too – the 80s P-funk of Georges Perin featuring Talkin’ About Dat and the breaks-funky Kylie Auldist collab. White Hot. Also present and correct are – deep breath – Kraak & Smaak, Boca 45, Aeon Seven, Ephemerals (twice), Soopasoul, Gizelle Smith’s recent Eric Boss-featuring single S.T.A.Y., Myles Sanko, Dr Rubberfunk, and Markey Funk’s superb Alfomega mix of Radio Trip’s Computers Singing. Oh – and no self-respecting Jalapeno comp. 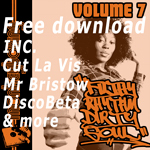 would be complete without a Skeewiff appearance – which will be why the closer, no doubt, is the mod-soul-jazz-breaks of the Coming Home Baby 7″ edit.